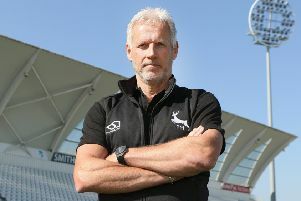 Head coach Peter Moores has applauded Steven Mullaney’s ‘measured’ approach to his early days as Nottinghamshire captain. The 31-year-old Mullaney took over at the start of this season after the retirement of long-term skipper Chris Read, and he has led Notts to the top of the Specsavers County Championship, First Division table, as well as a fair start to their defence of the Royal London One-Day Cup. Moore said: “It was tough following someone who had done it for such a long time, but Steven has done really well. To be a successful captain. you have to manage the team and be tactically very good but, equally importantly, you have to manage your own game. “Steven has done that, scoring the first hundred for the club this season in County Championship cricket and backing that up quickly with two 70s in one-day cricket. Tactics-wise, he has always been sound. I think he has always captained inside his own head for most of his career. “What he’s also doing now is showing real calmness in pressure situations. He’s measured and allowing others to get involved at the right time. But when he needs to take charge, he is doing that.